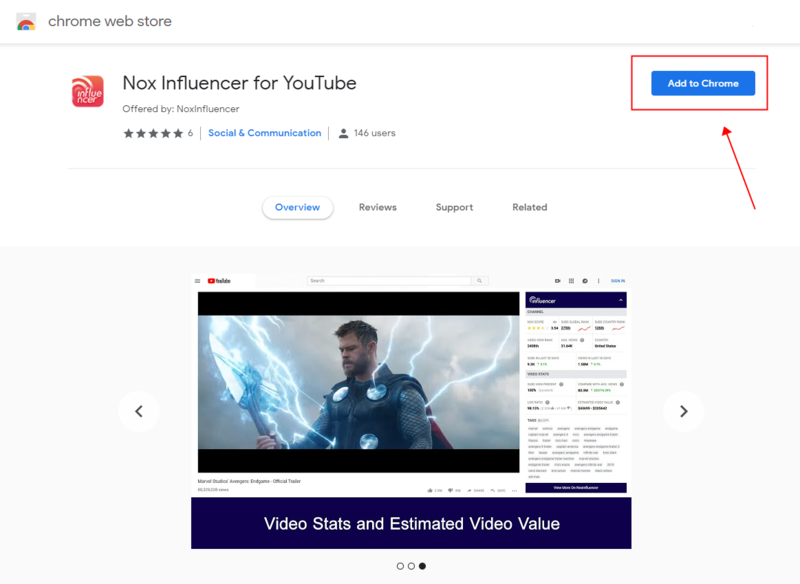 NoxInfluencer launches Chrome extension calls Nox Influencer for YouTube, which provides an easy way to view the channel statistics. With this tool, you will get more out of YouTube. It will help you manage, optimize, and grow your YouTube channel. You can get started totally for free and the best parts are that all of these features are available inside your normal YouTube interface. How to Install NoxInfluencer Google Chrome extension. First, click the link: https://chrome.google.com/webstore/detail/nox-influencer-for-youtub/ihmkhhipkhdggfjkclojpabkinmaphfg or at the chrome web store, search for [Nox Influencer for YouTube] and click [Add to Chrome] to install. Nox Influencer for YouTube Features- What does Nox Influencer for YouTube do? 2) SUBS GLOBAL RANK, World ranking, sorted by real-time subscribers. 3) SUBS COUNTRY RANK, Country ranking, sorted by real-time subscribers. 5) AVERAGE VIDEO VIEWS, NoxInfluencer calculate the average views of the last 30 videos. 9) ESTIMATED EARNINGS MONTHLY, NoxInfluencer provides YouTubers estimated monthly earnings according to average video views, the frequency of video updates and other factors in conjunction with local CPM prices. 5) AVG. 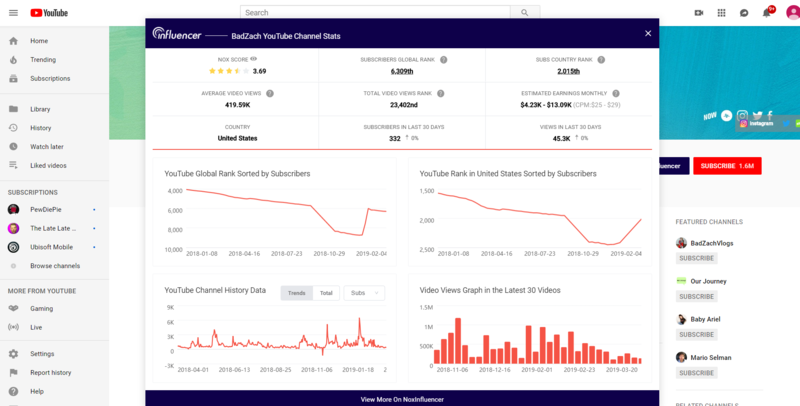 VIEWS, NoxInfluencer calculate the average views of the last 30 videos. 1) SUBS VIEW PERCENT, the percentage of subscribers have watched this video. 2) COMPARE WITH AVG. VIEWS, the current video views and the average views (latest 30 videos) difference. 3) LIKE RATIO, represent viewers preference for the video and the percentage of likes. 4) ESTIMATED VIDEO VALUE, NoxInfluencer calculates the possible profit of the video, by the NoxInfluencer video rating model combined with the viewing volume and CPM analysis. 5) TAGS, can be copied with one click. How to Measure YouTube Channel Success?